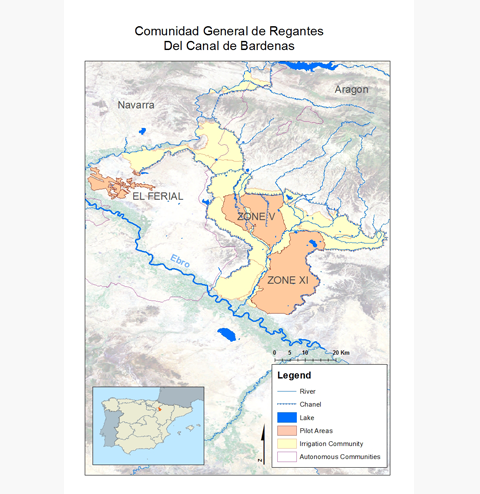 Comunidad General de Regantes del Canal de Bardenas (CGB) acts as water utility, managing the hydraulic infrastructure that supplies bulk water from the Yesa dam to 24 irrigation communities, as well as 41 municipalities. The main infrastructure is the Canal de Bardenas (52 m3/s, 111km), with 5 secondary channels, which add 174km more. The hydraulic infrastructure is regulated by 4 reservoirs: El Ferial, Malvecino, Laverné, San Bartolomé. The Laverne reservoir (37 Hm3), acts as regulator for the Sora channel and is equipped with a pumping system and a mini hydropower plant. WEAM4i demonstration especially focused on the main conveying infrastructure and the Laverne dam. In the secondary network, the 2 selected irrigation districts are Comunidad 5, Comunidad 11.